“Three hundred years ago, thirty thousand Indians dwelt in their camps in the terrain between Lake Simcoe and Georgian Bay. Three hundred and twenty-five years ago, Champlain stood on the north shore of Lake La Clie (Lake Simcoe), the first white man to view its fresh looking expanse. Two hundred and fifty-five years ago, La Salle came up the Humber River into Lake Simcoe, around the needle-like Big Bay Point, up to the head of Kempenfelt Bay, where the beautiful sandy beach made canoeing easy” (probably where the bus station now stands). In this epic manner May Creswicke began her history of Trinity Church 80 years ago for its Centennial, and her historical sketch is too good not to copy (except that you have to add 80 years to each of her ago’s). Mrs. Creswicke tells us that after the War of 1812 half-pay officers were, “induced to settle around the shores of Lake Simcoe, where they carved out of the bush those estates whereon they maintained the habits and culture of the homes they had left in the old land.” She suggests that this formed the nucleus both of “Trinity Church and the aristocracy of the early days.” To Read More, CLICK HERE. The Rev. Samuel Brown Ardagh (Trinity 1842–1869) was born in Fethard, County Tipperary, Ireland on the 8th of April, 1803. He was the eldest son of Rev. Arthur Ardagh, A.M. and Anne, daughter of Samuel Brown, of Fethard, a gentleman of independent means. His father was spoken of as a man of profound scholarship, and of wild and restless temper. He has 13 brothers and sisters, two of whom followed Samuel to Canada. Samuel J. Boddy’s book, “A brief memoir of the Rev. Samuel B. Ardagh, A.M., T.C.D., late rector of Barrie and incumbent of Shanty Bay, Lake Simcoe, Upper Canada”. [Toronto]: [s.n. ], 1874. Pg 3-4. In 1850, Rev. Samuel B. Ardagh applied to the Society for the Propagation of the Gospel (SPG) for an assistant, and Rev. Garret Nugent was sent out in 1851 from England. He lived in Barrie but did not take any services there, having the outside missions in his care. He returned to England in 1854 as Mr. Ardagh refused to separate Innisfil and the no parsonage had been built for him in the township, as promised, and altogether he was dissatisfied with the arrangements under which he lived and returned to his native country. He was greatly beloved, but the vestry commended Mr. Ardagh for his stand in regard to Innisfil. In 1856 the Building Committee reported the church was no longer suitable owing to age, and inaccessibility of location, and mentioned the offer of two lots on Worsley Street valued at £125 sterling, on condition a brick church be built to seat 500, the offer including the lot next door at a price of £50 if the parish would erect a plastered house for the sexton. 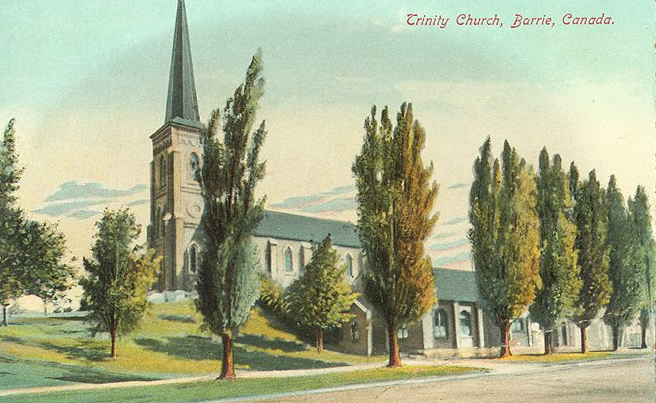 The plan did not materialize, as the following year the vestry arranged to add a cancel to the old church, which would allow for increased sittings for about 100 persons. The alteration cost £116. 18s. 9d. On August 4th, 1919, at a special Vestry, His Honour Judge G.R. Vance, acting as chairman, passed a resolution asking the Rector, the Rev. Canon Reiner, to appoint the Rev. A.R. Beverley of Quebec as “Vicar” at Trinity and Mr. Beverley entered on his duties.